To round out our week of examining French baby names and customs, here is one of my favorite choices for a girl! You voted for Colette on the poll that I had on the sidebar of the blog and she won with 40% of the vote! 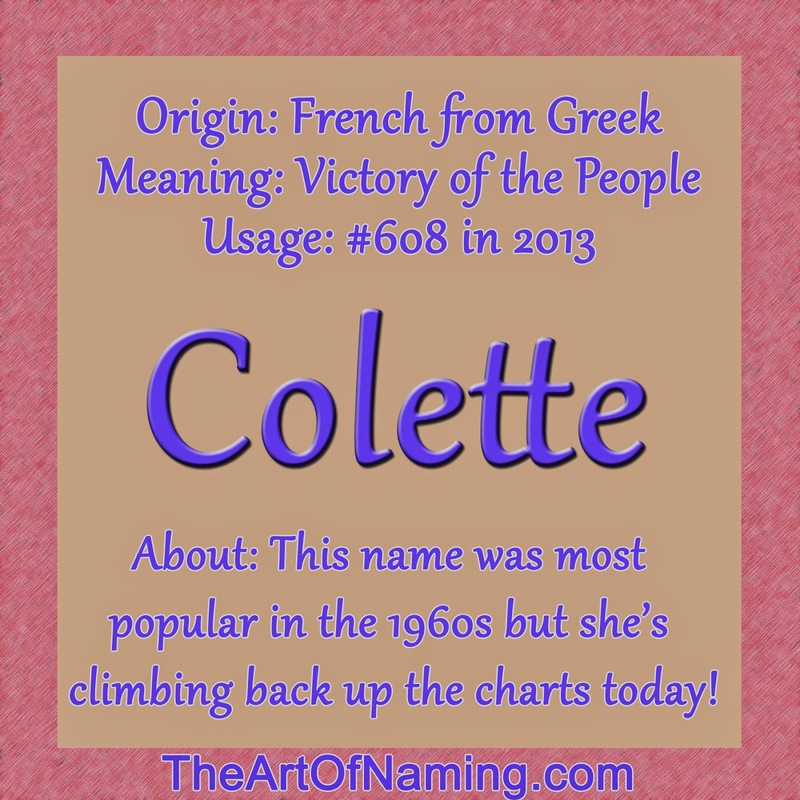 Colette is the short form of Nicolette which comes from Nicole, the French feminine form of the masculine name Nicholas. All of these related names (and believe me, it is a huge family tree) come from the Ancient Greek name Nikolaos. They all mean "victory of the people" from the Greek words nike meaning "victory" and laos which refers to "people". There are many names that come from this tree but let's focus on our lovely French name of the week, Colette. Famous namesakes include Saint Colette from 15th century France. She was a nun who was known for giving her money to the poor. There was also a French author known as Sidonie-Gabrielle Colette (1873-1954). There are several more that are listed on Nameberry if you'd like to view them. As a name, Colette first appeared on American babies in 1892. It wasn't until 1906 that the name gained regular yearly usage and by the mid-1940s, she began climbing up the charts. Her biggest popularity peak was side by side with many other -ette names in 1966 with 594 births for the year and a ranking of #372. In 1987 she completely fell off the Top 1000 chart and it wasn't until 2012 that she made a reappearance. Jumping from #1040 in 2011 to #659 in 2012 is quite a big deal, even if it only accounted for 424 births. Now in 2013 with 456 births, she's up to #608! This means that she's climbed 432 ranks in just 3 years! If she continues climbing at that pace, we could expect to see more of her in the near future! With this new-found momentum in the popularity game, Colette is a proving to be refreshing to modern parents' ears today! This name is a lovely French option that can also work very well on non-French baby girls. It is a bit fresher today than Nicole and not as long as Nicolette, but Colette is still unique enough to bea great under-the-radar choice! Nicknames could include Coco, Coli, Cole, Lette, Lettie & Ette. Can you think of more? Below are some names that I'd personally pair with Colette. What would you use? Feel free to share them with us in the comment section below or on Facebook!